It is rewarding, if surreal to be writing the final formal assignment of my undergraduate career. In some ways it seems like yesterday that I got the email informing me of my acceptance into Berklee College of Music, and about half a day ago that my parents dropped me off at 270 Commonwealth Avenue. From there I embarked on my road to higher education. In some ways the past four years have dragged on, and I could not wait for graduation day. Like anything, the passage of time is just a matter of perspective. The closer you get to the daily minutia of being a college student, the longer the span seems, as I take a step back, and look at my college career from a ‘50,000 foot’ level, four years has seemed like nothing! I have forged many relationships I will cherish and fortify over the years to come, played an endless amount of bass guitar, written page after page of essay, and came to love the city of Boston. It was not until I attended an internship information session in the large, first floor classroom in the 22 Fenway building that I found the drive that would carry me through the remainder of my college career. It was an informational session explaining the internship process at Berklee. Prior to that information session, all I knew of the Berklee’s internship process was that it was a mandatory requirement for me in the Music Business and Management department. After this meeting, I was renewed. I made my purpose at school to get the best possible internship I could. The freedom that I had in regards to where and what I could do was liberating, and I set the wheels in motion at an early time in my school career. I had 12 transfer credits from AP classes in high-school allowing me a jump start into the MB/M program, and I did everything in my power to structure my schedule in such a way that would allow me to focus on my internship unfettered by other classes. Through many semesters of stressful course loads, in addition to nightly band rehearsals and working a part time job an average of 20 hours per week, I was able to do just that. My schedule had become a careful balancing act. It was not until the first semester of my senior year that I was able to get more serious with the Office of Experiential Learning’s internship database. This gave me a glimpse into a sample of Berklee approved internship programs. I liked what I saw, with promising programs at Atlantic Records, A&M Octone, NBC Universal, Rights Flow, and about 5 others. I got my Resume prepped, Individual cover letters drafted, and I pulled the trigger and sent off every one. It was a good feeling to know that the process on my end had actually come to this point, and that now; the decision was out of my control. I should mention that I applied for internships in the spring semester, meaning I was sending my applications out just before and during the holiday season. The only reason I think this is of note is because of the lack of response I got from almost everyone I contacted. Atlantic did call me back, in fact the very day I sent out my application! They thought that I would be a good candidate to intern at their Indie label, Canvasback. After waiting patiently, and sending them a follow up email, as well as giving them a call back, I heard nothing. By December, I had still heard nothing from any company I had applied to. I felt a bit stressed at this point, because I did not have much more time to find an internship for the next semester, added to the fact that I needed to find off campus housing for wherever I would eventually go. One day, fairly late in my search I came across a new posting for an intern position at PAID Inc. The position I applied for was Assistant to VP of Client Relations. I researched the company, and it seemed like a place I could see myself at. I sent in my application, and within one day, had an interview lined up. Best part about the process, was that their office was on Huntington Avenue, just a few blocks from Berklee’s campus. Donned in my finest, I left for the interview. I met with Dave Lory, the VP of Client Relations, and Andy Martel, Senior Client Manager. PAID Inc. (Professional Alliance of Innovation and Development) is a celebrity services organization, with a wide array of services that can help a client capitalize on their brand, through full merchandising services, online marketing, video production, web development, and the implementation of VIP ticketing events. We can provide these services to any client, but most typically work with performing artists and personalities, along with organizations looking for merchandise services such as Aerosmith, the Moody Blues, Motley Crue, Ron White, Stand up to Cancer and others. The interview went well and they basically offered me the position on the spot. Both impressed me in their experience and the level of seriousness they were looking for out of an intern. The client management department is where PAID and an artist or client’s management meet, discuss business propositions, foster growth for existing clients, and drive brand profitability. I was assured that I would be doing much more than ‘intern grunt work’ and would have a high level of involvement, as a basic function of my role as assistant. I accepted the position, but a few things needed to be worked out. The company would be moving from their downtown Boston location to Westborough, in order to accommodate growth, and to consolidate their warehouse in Worcester. This meant I would need a car, and also a place to live where I could have a car. The date was December 15th, and I was to start my internship January 4th. Luckily things worked out smoothly, and I found an apartment in Medford on craigslist, and promptly moved in ready for my January 4th start date. Scott Beardsworth has been studying music in some way, shape, or form, for the past 17 years. 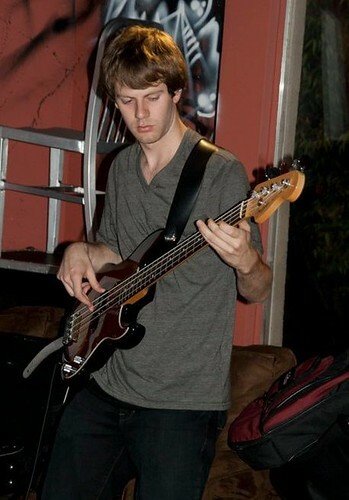 Starting on Piano and moving to electric guitar and tuba, until finding his true instrumental calling of Electric Bass. Upon acceptance into Berklee, Scott chose to pursue the Music Business major. With an equal love for all things business and music, this major was a perfect fit, allowing him to learn the business ropes, in an exciting field, close to his heart. Most exciting to Scott was his required MB-495 internship. He remembers sitting at the first internship meeting in his sophomore year, thinking about how exciting it will be to get real experience in the field he loves. Two years later, Scott has started his internship at a dynamic company located in the Boston area. PAID inc. is a turnkey celebrity services outfit, specializing in VIP events, merchandising, online marketing promotion, video production and more. The company serves industry A-listers such as Aerosmith, Iron Maiden, Motorhead, and many more. In his free time, Scott loves playing music with people of all walks of life and disciplines, especially with his two bands Goliath in Transit and Skylab. If anyone has questions or wants to reach out to Scott, feel free to do so on his personal Facebook, or by email at sbeardsworth@paid.com. Check out his band Goliath in Transit on Facebook!